The leading independent specialist for windscreen replacement and windscreen repair based in Hereford and serving all of the Hereford area. National Windscreens Hereford fitting centre provides windscreen replacement and windscreen repair services to businesses and individuals throughout Hereford and the Hereford area. 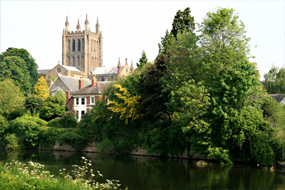 Hereford is located for easy access from the A49 , A465, and A438, all of which run through a city centre that is renowned for its quirky independent shops and specialist retailers. The bustling market towns and rural villages throughout surrounding Herefordshire combine warm hospitality with busy attractions such as farmers markets. From cider and beer produce to poultry and the famous Herford breed of cattle, Herefordshire is a thriving trade centre. The Hereford windscreen fitting centre and its mobile vehicle glass technicians service the needs of Hereford and the surrounding area including Leominster, Ross-on-Wye, Bromyard and Kington. With 108 fitting centres and over 800 mobile technicians, National Windscreens operates the UK's largest windscreen repair and windscreen replacement network. The company provides low cost, high quality windscreen replacement and windscreen repair from its Hereford fitting centre 24 hours a day, 7 days a week, 365 days a year. Repair and replacement of all types of vehicle glass including windscreens, rear windows and side windows is undertaken throughout Hereford and all of the Hereford area.